This page is an expanded version of the liner notes of my cd "Obsolete Systems"
on the EMF Media Label of The Electronic Music Foundation. Each musical instrument, whether electronic or not, implies an aesthetic domain and sensibility unique to its design. This comprises both its sonic output and the method whereby a human being interacts with it to form and control that sonic output. With new instrument designs having proliferated almost exponentially in recent years, I am pleased to see increasingly widespread interest in those historic few which, though now obsolete and limited in many ways compared to current technology, succeeded aesthetically and musically. These are a few I've personally explored. When it was new, each of these music systems, now long obsolete, was state of the art, visionary, radically new and so revolutionary that it required extended explanations in response to common questions such as "Why would anyone ever want to do that?" Click on the audio icons to hear the pieces using . Electrocomp 100 modular analog synthesizer. Modular analog synthesizer, built by Don Buchla, mid-1960s. Electrocomp 200 modular analog synthesizer by Electronic Music Labs, CT circa 1969. Buchla 100 modular analog synthesizer with tape delay. I had started as an improviser, largely self-taught and playing by ear on "folk" plucked instruments. Once I began a formal study of music, only after college studies apart from music, I had to learn to adjust to writing silent notes on paper with a dim hope of possibly eventually hearing them played by others, though my lack of keyboard skills with which to compose and do theory exercises ultimately benefited my mental musical training. It was many years before I felt at home writing instead of directly playing my own musical creations. When one of my teachers at Juilliard, Michael Czajkowski, took me to see Mort Subotnick's Buchla studio upstairs from the Bleeker Street Cinema ( Juilliard did not yet teach or even allow electronic music at that point) and I soon began to work with that instrument myself, music turned back into the medium I had loved. In fact it went far beyond that, virtually turning from black-and-white into color. Not only could I work directly with sound itself again, like painters and authors do on their works, instead of indirectly encapsulating them in abstract sets of instructions to others in an imperfect notational language, but also, I was able at last to represent the tenuous and vague sonic shapes that formed in my imagination and in which my inner emotions had always taken previously inexpressible form. Ironically, my need for greater control, complexity, replicability, subtlety and precision led me within just a few years to an even less direct means of composition: the writing of computer code to describe my own musical decision-making, and by use of logic to attempt to enhance the musical power of any individual through new instrument creation. Realtime digital audio synthesizer by Hal Alles et al, Bell Labs. This composition was commissioned by Bell Labs and the Motion Picture Academy for the 50th anniversary of talking pictures. Working with the Alles synthesizer, with its extensive array of input and output channels for control, was a real pleasure after years of GROOVE's extreme restrictions. The interactive software I wrote for this composition recycles the player's keyboard input into an ongoing accompaniment. However, writing the software from a remote DEC PDP-11 computer (see also the PDP-11 FAQ and PDP Music Survey) in the new "C" computer language still undergoing frequent change, within a still-experimental UNIX operating system, without the control inputs or sonic output, under a tight deadline, while the Alles synthesizer hardware was still under construction, turned out to be quite an adventure. Apple II computer with Mountain Hardware oscillator boards. I wrote this algorithm in the Apple Pascal language with additional 6502 assembly language modules, based on analysis of Bach chorale style harmonic progression. A simplified version of the algorithm and data structures used in this example are documented in my paper "Sonic Set Theory: A Tonal Music Theory for Computers"). A later C-language Macintosh MIDI implementation of this same algorithm can be heard on my early 1990s cd "Unseen Worlds". Although I used the same hardware as the alphaSyntauri music system, of which I had been an early co-developer, I did not use the Syntauri's keyboard or any of its software in this particular work, but you can read about them in our 1980 AES paper (pdf reader required). Electronic tape. Realized on McLeyvier computer-controlled analog synthesis music system. To quote Mark Vail, "Like an object caught in the Starship Enterprise's malfunctioning transporter, the McLeyvier shimmered between existence and Limbo for a few years beginning in 1981." It consisted of an impressive console on a DEC LSI 11/23 computer that controlled a bank of analog "voice cards" through 50 digital-to-analog converters per card (a whopping 800 DACs to cover all the control voltage inputs in a 16-voice system!). The system included a macrolanguage for configuration and composition, music notation, SMPTE synchronization, and a host of other features, many of which were not available on any other system at the time. Designed and originally implemented by David McLey, software directorship of this instrument fell to me in 1982. While working on these movements, I thought of them as distinct separate pieces in an ongoing series of musical archtypes. After recording them from computer onto tape, I realized that they formed the movements of a single work, a trilogy, with the slowest and deepest movement, which was inspired by some of Shostakovitch's works, in the traditional center position. This piece evolved from sketches for my chamber orchestra piece "Hearing Things". After completing "HT", I realized that the instrumental writing had wandered away from sonic vistas that the early sketches had embodied, so I went back to capture and refine them in this work. This insight was a miniature of a larger one, that much of my algorithmic and interactive, rhythmic and motivic composition of the 1970s had wandered away from the types of sonic vistas of the imagination that had so strongly attracted me to new technologies in my earlier explorations of electronic realms of sound. Such almost-visible edgeless sound worlds, populated with allusions to animal and human vocalizations immersed in colored textured seas, may be a music more primal than musics made of "notes" but perhaps not as easily captured, discussed or realized. GROOVE Hybrid System, Bell Labs (computer controlled analog synthesis). Computer control added to analog synthesis the abilities to generate, describe, store, and edit a musical work or process in far more complex and varied ways than had been possible with only instrument and tape. The GROOVE Hybrid System at Bell Labs, Murray Hill, was also a breakthrough to realtime interaction with composer-describable process and structure, via interaction with live time-based processes described by logic as algorithms and accessing realtime computer input devices. Realtime sound synthesis was done with analog audio modules, as it would not be possible for several more years to synthesize sound digitally fast enough to be able to interact with and mold it by ear while hearing its generation. GROOVE (for Generating Realtime Operations on Voltage-Controlled Equipment) brought together analog electronics and the memory, precision, and logic of digital computers. Due to the limits of 60s and early 70s technology, too little computation power and too few control lines were available to permit simultaneous freedom in timbre and structure both at once. GROOVE may have been a digial-analog hybrid, but the sounds in this piece are neither analog nor digital synthesis. Instead, the computer was used to make sudden sharp electrical transients, simply the sound of individual bits being turned on and off, which were wired out to pulse high-Q resonant filters that Emmanuel Ghent and Max Mathews had built. Pitch was purely a function of filter cut-off frequency. Electrocomp with classic tape techniques and Echoplex (a tape-delay device of the 1970s). Possibly my only musically successful microtonal piece, "Voices Within" came together over several months of sustained and arduous work during which I synthesized and recorded the individual sounds and fit them together. Much hand-splicing and tape overdubbing was involved in achieving the harmonic and melodic content. Much intuitive soul searching produced the overall form and content. "'Voices Within: A Requiem' was composed throughout the winter of 1978-1979, by old-fashioned analog means, with lots of splicing and overdubbing, using 1969 Electrocomp 100 and 200 synthesizers. In order to warm the sawtooth and square waves toward greater vocalness, I used tape flutter and overmodulation at certain stages to make the oscillator tones sound more vocal and an Echoplex (and see here) to thicken and distort the EML 200's sound to make the textures. There are no actual voices in this piece. I had been working with various kinds of material which all related to a quality of feeling that endured in that winter, and at a certain point, these various materials began coming together into this single work. "'Voices Within' sprang from a need to express a range of strong inner emotions which I could best couch in a language of harmony and timbre, ambiguity and edgelessness, for which analog synthesizers may still be best. Though this piece may seem to be a radical departure from the modal rhythmic style of my (to date) better known works, 'Voices' represents, instead, my returning to a sonic vocabulary which I have used since long before I enjoyed the precision and logic of computers, even though my work in this direction has been considered less record-worthy until now. "As well as being a return to a medium I used to use more, 'Voices Within' includes post-romantic chord progressions which (though mistuned) are practically straight out of Mahler, especially the hand-spliced ones near the end. The underlying bass progression, which sustains the momentum of the piece, consists of two contrary-moving pairs of lines. Glissando motion doubles these stepwise lines, to add changing beat patterns. The A-B-A-coda form is really created by texture and timbre, though, by the expressive qualities of the sheer material of sound, not by harmony. "Just as frequency and tempo are different only because they are on opposite sides of the human perceptual threshhold for grouping and differentiating, I believe there to be only an analogous perceptual difference between timbre and harmony. Whether we do or do not perceive the components of a complex sound as separate tones, harmony and timbre share an extraordinarily high degree of expressiveness." 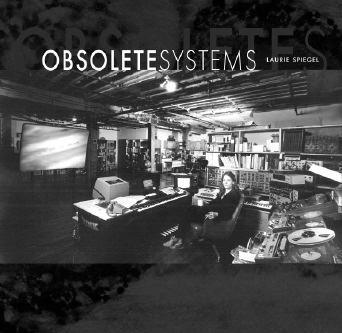 Wired's "Music Technology: A Timeline"
All Obsolete Systems cd music, liner notes and this web page are by and (c) Laurie Spiegel / Laurie Spiegel Publishing (ASCAP).